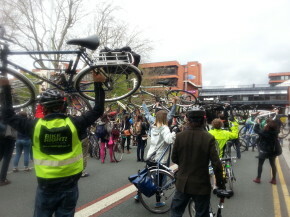 Over 100 cyclists took to the streets for a Manchester Cycle Flash Mob on Saturday the 4th of May. The flash mob was organised by the Coffee Cranks Cooperative to raise awareness of Manchester Councils Oxford Road consultation that is taking place. The flash mob was attended by a swarm of cyclists of all ages that took over the busy Oxford Road close to Manchester University. Cycles were held aloft blocking the road in which was a tremendous show of support for safer cycling in Manchester and along the busy and often dangerous Oxford Road corridor. Oxfords Road is one of the busiest public transport routes in Europe with very high traffic and bus flows and this combined with cyclists is often a dangerous mix. The proposals being put forward include a cycle/bus only section between Grosvenor Street and Hathersage Road. This will incorporate a segregated cycle lane on the road. For more information on the consultation see the TFGM website.